Happy New Year to you. I hope you all had great start of new year. I meant publish this post last year but few things kept me busy and I couldn't publish it on time. 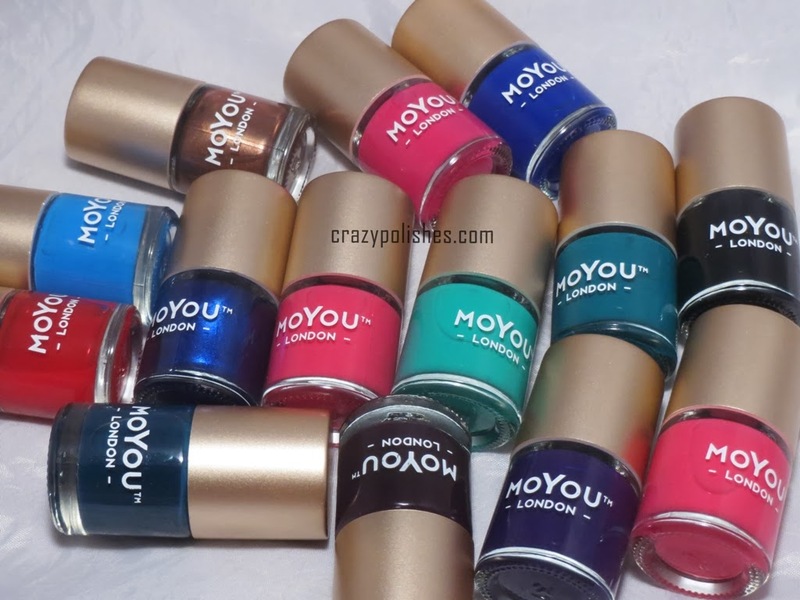 You may know that Moyou London recently launched their stamping polish collection. Since the launch everybody is curious to know more about these polishes, so here I am with a detailed review and swatches of these stamping polishes. **picture heavy** please click on read more to see detailed post. The shades are widely divided in red, pink, blue, green, purples and black color. These bottles contains 9ml of polish. These polishes arlier were selling for £4.99 but now these are available for £3.99. One thing i didn't like much is there is no mention of name anywhere on the bottle or on the packaging. Which is actually one of the reason why this post get delayed, because i didnt know the exact name of shades and when i checked on website most of the polishes were unlisted(or out of stock I am not sure but they are in-stock currently). I still have confusion between Forest Green-Midnight Green and Violet-Dark Violet-Byzantine Violet. 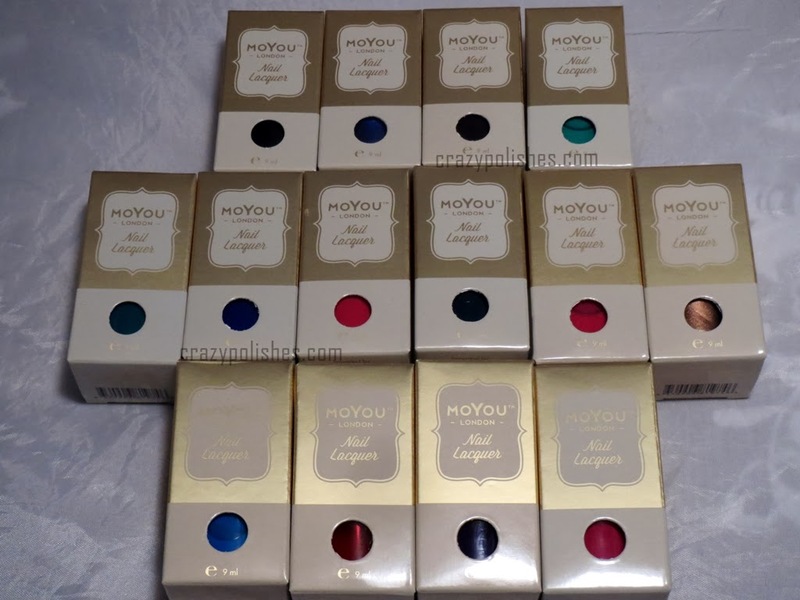 Well it very much self explanatory but the good news is Moyou is working on creating a better formula for stamping polishes and hopefully soon will be come up with a better version of this collection. I did a manicure using few of these polishes on lighter base colors. Stamping polishes i used from this manicure from thumb to pinky finger are Metallic Blue, Baby Blue, Palatinate Purple, Electric Crimson and Midnight Green. Stamping Plate is Moyou Fairytale Collection 01. 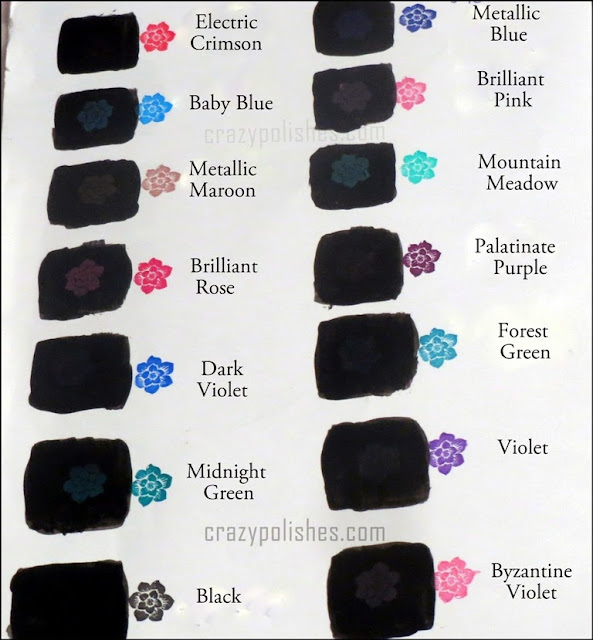 Pros: - wide range of stamping colors. Cons: -doesn't show up on darker base color. -lacking a white stamping polish(not actually a con though but more of a suggestion). - polish name is no where mentioned on the bottle. Its ok if you buy one of two shades and colors are completlely different than one another (like some blue or pink) but if you buying in a lot than it creates a confusion about which is which. I hope the new formula polishes will be launched soon. I will keep you informed if I come to know about any news regarding these. You can buy these polishes from Moyou Website. Moyou is also launching a new collection called "Scholar" later today. This collection has six stamping plates. I hope i mentioned everything regarding thee polishes in the post. If you have any query or doubt please feel free to ask in comment box below. ** product sent to me for review however i am honest in my opinion.